Kingston continue commitment to BASDA. For many years now Kingston Developments have been an active member of BASDA. The Goods In process enables a methodical and efficient process for receiving ordered goods into the warehouse. 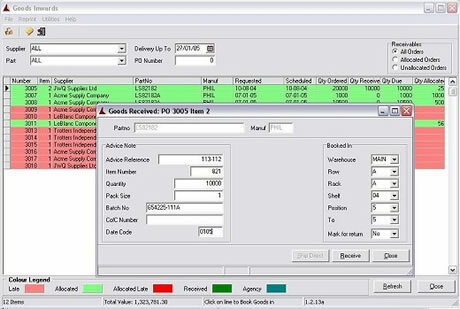 The operators have full view of all outstanding purchase orders and may select each line by matching the incoming documentation with the information on screen. As individual lines are booked, the system allows for the recording of serial number, batch numbers and date codes as well as quantity figures. Each batch is recorded separately to enable KBS to offer full batch traceability. GRN documents are automatically generated, and may be called up on screen when Invoices are received. Goods Inward may be recorded in using barcode reading equipment and documentation may also be printed using barcodes if required. Control over booking in process. Save time through use of barcodes. Sales goods can be shipped automatically. Minimises handling and storage errors. Automatic handover to Goods Out. Orders due can be displayed and selected. Sales orders automatically scheduled on Despatch queue. Goods in (GRN) notes produced automatically. Colour coding to identify state of orders. Reallocation of stock to orders as user discretion. Goods In module Goods received screen.